Novelist, poet, literary scholar and essayist Mukoma Wa Ngugi is the author of Nairobi Heat (Penguin, SA 2009, Melville House Publishing, 2011), an anthology of poetry titled Hurling Words at Consciousness (AWP, 2006) and is a political columnist for the BBC Focus on Africa magazine. He was shortlisted for the Caine Prize for African Writing in 2009. In 2010, he was shortlisted for the Penguin Prize for African Writing for his novel manuscript, The First and Second Books of Transition. 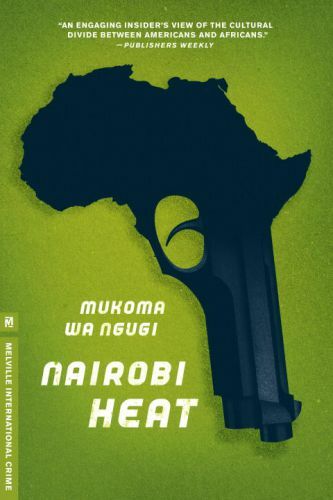 Editions of Nairobi Heat are forthcoming in Kenya (East African Publishers) and Nigeria (Cassava Republic Press). Finding Sahara, the sequel to Nairobi Heat is forthcoming. Mukoma will be joining Cornell University in the fall of 2012 as an Assistant Professor of English specializing in 20th-century Anglophone African literature. Below is an e-mail interview with Mukoma. Vitabubooks: What drew you to Nairobi Heat? Where did you get the information or ideas? Mukoma Wa Ngugi: It was a random event in Madison, WI [Wisconsin, United States], where half the book is set. I came home late one night and found a white woman passed out, from too much alcohol or drugs, by my door; I did not know her. I called the police to ask for an ambulance. The police officer who accompanied the ambulance happened to be an African American. So there we were, an African American, an African and a passed out white woman–and that became the basis for Nairobi Heat, where an African American detective investigates the murder of a young white woman and his main suspect is an African. Vitabubooks: How long did it take you to write the book? Where did you write? In Nairobi or the US? Mukoma Wa Ngugi: Once I had the plot, it really was just a matter of following the characters, I wrote the first draft in three months while in Madison, WI. Vitabubooks: What was one of the most surprising things you learned during Nairobi Heat's creation? Mukoma Wa Ngugi: Well, I thought that the plot was truly a creation of my imagination until a few weeks after I was done with the first draft, I came across a Wall Street Journal article that was ‘factualizing’ my fictional accounts. The idea of using philanthropy as cover for corruption is not new, yet it is always surprising. In the novel, corrupted philanthropy becomes a mask for Rwandan genocidaires. Vitabubooks: What kinds of things have readers said about Nairobi Heat? Mukoma Wa Ngugi: I read all the reviews that come my way. [A]t its most basic, a review is a reader responding to what they thought of your story, or of you as a story teller. I find blog reviews useful; more than newspaper reviews, which tend to be formulaic — love the book find something negative to say, and hate the book find one positive thing to say, both leading to ambivalence. The bloggers have a following because they have established the kind of relationship with their readership that requires honesty. And hence the criticisms that come from bloggers have value to me as a writer because I am eavesdropping on this honest exchange. It is really a more democratic literary space. So in this context of honest appreciation of Nairobi Heat, I can say that there has been the good, the bad and the ugly, but the reviews and discussions have been useful. So when writing the sequel, I was okay with letting my imagination hover over the blog reviews and take note. Vitabubooks: When did you first realize you wanted to be a writer? As a child, did you want to be a writer like your father? What does he think of your writing? Mukoma Wa Ngugi: I grew up around books, [would] sit in my father’s office as he wrote. So I took it for granted. But really when I was a kid, I wanted to be an engineer. And then when I got to college I wanted to be a political scientist but I took so many literature classes that I ended getting a degree in both. But I have been writing for as long as I can remember, so in hindsight all I did was to stop doing the other things and was left with writing. From what he tells me, my father enjoys my writing, but I also suspect that no parent objects to his children following him in what they do — most of the time anyway. Two of my elder brothers, Tee Ngugi and Nducu wa Ngugi, and my younger sister, Wanjiku Wa Ngugi, all have books coming out this year with East African Educational Publishers (EAEP). Nairobi Heat is also being made available in Kenya by EAEP this year. Vitabubooks: Do you have a favorite book from childhood? Mukoma Wa Ngugi: A friend of mine (I must have been about 14) gave me a torn up thriller that did not have a title page. It was so enthralling that for about two days I did nothing but read. What this friend of mine did not tell me was that novel also did not have a last page. And I did not think of checking because – who gives you a book without a last page? Even though a great source of torture, it has been my favorite book, every now and then I come up with a different ending. Vitabubooks: What other books do you re-read? Mukoma Wa Ngugi: The... ones I enjoy teaching. That is why I prefer to teach books that will reveal something new, be it major or just a nuance, with each reading. And at the same time books that matter differently for each reader. Just to mention a few of these books – my father’s A Grain of Wheat, Nawal Saadawi’s Woman at Point Zero, and Helon Habila’s Waiting for an Angel. Vitabubooks: What are you reading right now? Mukoma Wa Ngugi: I am reading Lyrae Van Clief-Stefanon’s collection of poems, Open Interval. There is a book that I read about a month ago that is still very much on my mind, a memoir by Eva Kasaya, a former house-maid in Kenya, called Tales of Kasaya, that I have been recommending to everyone I meet. It is one book that captures Kenya today, and the contradictions of the post-colonial state, told patiently, beautifully and with a quiet but ferocious courage. Vitabubooks: What authors have inspired you? Mukoma Wa Ngugi: I would rather think of an author in relation to a book or books that have added something to my understanding of my own imagination and what it can do – or what its ambition should be. Meja Mwangi’s Carcase for Hounds, Ben Okri’s Famished Road, Louise Erdrich’s The Last Report on the Miracles at Little No Horse, Assata Shakur’s biography Assata: An Autobiography, Can Themba’s The Will to Die, James Welch’s Fool’s Crow and many others. Vitabubooks: What would you say is your interesting writing quirk? Mukoma Wa Ngugi: I like to listen to blues music when I write – I guess for that reason there is a lot of music in Nairobi Heat. And when traveling I like to get to the airport hours before my flight, then I have no choice but to write or edit. Vitabubooks: What do you like to do when you're not writing? Mukoma Wa Ngugi: I like to play the guitar and listen to live jazz and blues bands in small bars. Vitabubooks: What are you working on now? What's next? Mukoma Wa Ngugi: Well, I just got done with the sequel to Nairobi Heat tentatively titled, Finding Sahara. I would like to put together another collection of poems but for now let’s just say I am happy to let my imagination lie fallow.